I love the phrase “THE fundamental theorem of…” It’s so over the top and hyperbolic, which is unlike most mathematical writing you’ll run into. So you know that it’s important if you run into the fundamental theorem of anything. By now we all have some background on geometric group theory: you’ll want to know what a group action is and what a quasi-isometry is. (Refresher: a group G acts on a space X if each group element g gives a homomorphism of the space X to itself. A quasi-isometry between two spaces X and Y is a function f so that distances between points get stretched by a controlled scaling amount + an additive error term). We say a group G is quasi-isometric to a space X if its Cayley graph is quasi-isometric to X. Remember, a Cayley graph is a picture you can draw from a group if you know its generators. There are several more terms we’ll want to know to understand the theorem, but I’ll just do one more before we start. We say a group G acts on a space X by isometries if it acts on X, and each homomorphism is actually an isometry (it preserves distance). 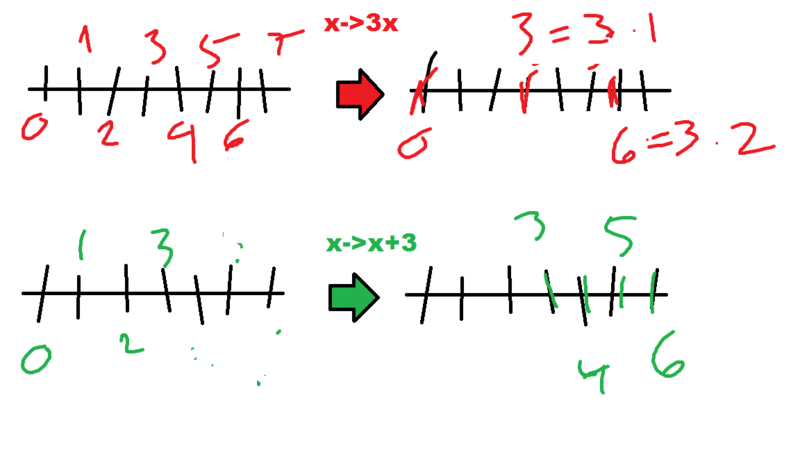 So for instance, the integers acting on the real line by multiplication isn’t by isometries, because each homomorphism spreads the line out (so the homomorphism of the reals to themselves given by 3 is , which stretches out distances). But if the action is defined by addition, then you’re okay: preserves distances. Under the red function, f(2)-f(1)=6-3=3, but 2-1=1, so this isn’t an isometry. Under the green function, f(2)-f(1)=5-4=1, which is equal to 2-1. This is always true, so this is an isometry. If a group G acts properly discontinuously, cocompactly, and by isometries on a proper metric space X, then G is quasi-isometric to X. You can parse this so far as “If a group G acts by isometries on a space X with condition condition condition, then G is quasi-isometric to X.” Putting aside the conditions for now, how would we prove such a theorem? Well, to show something is quasi-isometric, you need to come up with a function f so that the quasi-isometry condition holds: for all x,y in X, we need . So let’s deal with those conditions! An action is cocompact if there’s some compact subset S of X so that G-translates of S cover all of X. Remember, each element g in G gives an isometry of X, so it’ll send S to some isometric copy of itself somewhere else in X. In our example above, the integer 3 will send the compact subset [5,7] to the isometric copy [8,10]. In fact, our example action is cocompact: you can keep using [5,7] as your compact set, and notice that any point on the real line will eventually be covered by a translate of [5,7]. For instance, -434.32 is covered by [-435,-433], which is the image of [5,7] under the isometry given by -440. This action is also cocompact. Here I have the plane, conveniently cut up with an integer lattice. Can you figure out what the action is? 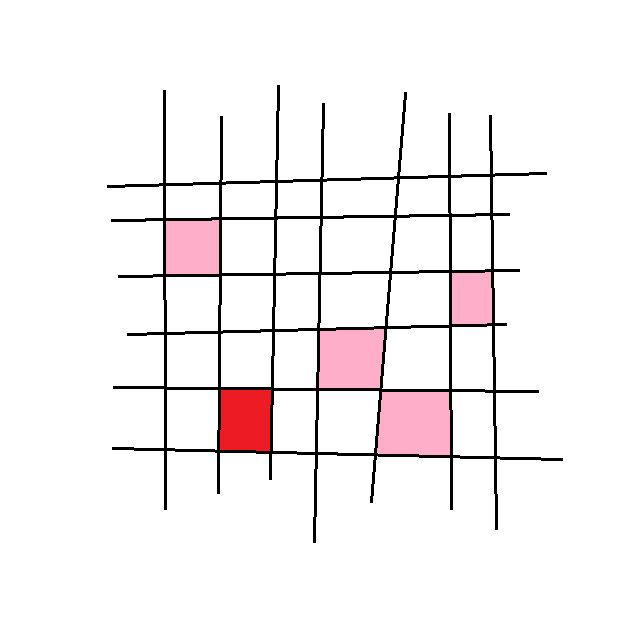 Hint: the red square is a unit square, and the pink squares are suppose to be various translates of it. 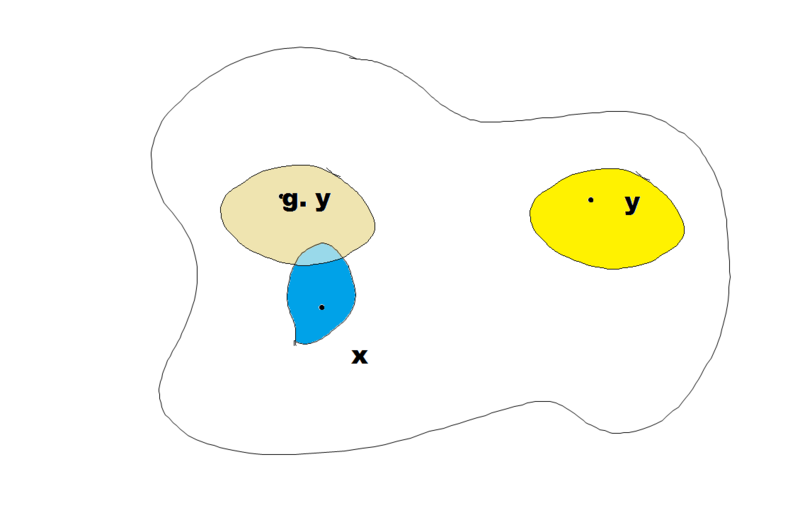 G acts on X properly discontinuously if for any two points x,y in X, they each have a neighborhood so that only finitely many g make . Let’s look at our example action again. If I take the points 4365.234 and 564.54 in the real line, I’d like to find neighborhoods around them. Let’s choose the intervals [4365,4366] and [564,565]. The only integers that make these hit each other are -3801 and -3800. In particular, 2 is finite, so this indicates proper discontinuity. If we actually wanted to prove the action is properly discontinuous, we’d want to show this is possible for all numbers, not just these two specific ones I chose. Finally, a metric space X is proper if all closed balls are compact. Balls are intuitively defined: they’re all the points that are at a fixed distance or less from your center. In the plane, balls are circles, centered around points. And compact-well, aw shucks I haven’t defined compact and we’ve been using it! Time for some topology. We’ll prove this theorem next time around, this post is just definitions and background. (Sorry for the cliffhanger, but it should be clear what we’re going to do next time: make a function, show it’s a quasi-isometry). Just like groups are the fundamental object of study in algebra, open sets are the fundamental object of study in topology. You’re already familiar with one type of open set, the open interval (say, (6,98), which includes all numbers between 6 and 98 but doesn’t include 6 and 98). I just described another above: balls. So, open circles in the plane are open sets. Sets are closed if their complement is open: that is, the rest of the space minus that set is open. In the real line example, [6,74] is closed because is open (it’s the union of infinitely many open sets, say (74,76) with (75,77) with (76,78) and on and on). Notice that I haven’t yet defined what an open set is. That’s because it’s a choice- you can have the same space have different topologies on it if you use different definitions of open sets. I’ll point you to these wikipedia articles for more examples on that. A set is compact if every covering of it by open sets has a finite subcover. That means that any time you write your set S as a union of open sets, you can choose finitely many of those and still be able to hit all the points of S. From above, the set is not compact, because you can’t get rid of any of the sets in that infinite covering and still cover the set. On the real line, a set is compact if it’s closed and bounded (this is the Heine-Borel theorem, a staple of real analysis). So that’s enough for today. More next time (like a proof!) Also, I’m using my husband’s surface to blog this, which means I did all the pictures using my fingers. It’s like finger painting. What d’you think? Better than usual pictures, or worse? My friend Teddy pointed out that the proper metric space actually has to be geodesic. I checked Bridson Haefliger, which say that it has to be a length space, not actually proper, in order for the theorem to go through. [Other results say the space will end up being proper and geodesic]. In any case my original way of writing the theorem is wrong, but I’ll address that in the next post of this series. To see why the geodesic (or length space) condition is necessary, suppose H is a subgroup of a hyperbolic group G. Think of H as a (disconnected) subset of the Cayley graph of G; since subsets of hyperbolic spaces are hyperbolic (with the induced metric), H is with this metric is hyperbolic, and the natural action of H on itself is clearly proper and cocompact. So subgroups of hyperbolic groups act properly and cocompactly on (non-geodesic) hyperbolic metric spaces, but not all subgroups of hyperbolic groups are hyperbolic. This is implied in the way you stated the theorem, but part of the theorem is that any group which acts properly and cocompactly on a geodesic space is finitely generated. Finally, one historical note. Despite being commonly referred to as the “Milnor-Svarc Lemma” (or sometimes “Svarc-Milnor”), this theorem was first proved by Efromovich in 1953, then again by Svarc in 1955, and finally by Milnor in 1968. Note the lack of communication between Russian and American mathematicians in the 50’s and 60’s. Did you mean homeomorphism? Or does homomorphism have a meaning for spaces that I wasn’t familiar with? Ha no I actually just meant bijective map; I was mixing up the homomorphism GxX->X with the bijection X->X defined by g.